I've been getting so much wear out of my new black dress, as it bridges the office to evening gap with very little effort. My favourite footwear to wear with the dress has been my leopard print slippers, but when I saw this picture below of Poppy Delevingne, I realised that this dress with my trusty grey Converse baseball boots would be a whole new way to go.So now my black dress looks weekend worthy, and I don't feel too dressed up for a mooch around the charity shops or a flea market. Here are some high-street options for an all-occasions black dress - machine washable is essential for a versatile easy to wear dress like this. 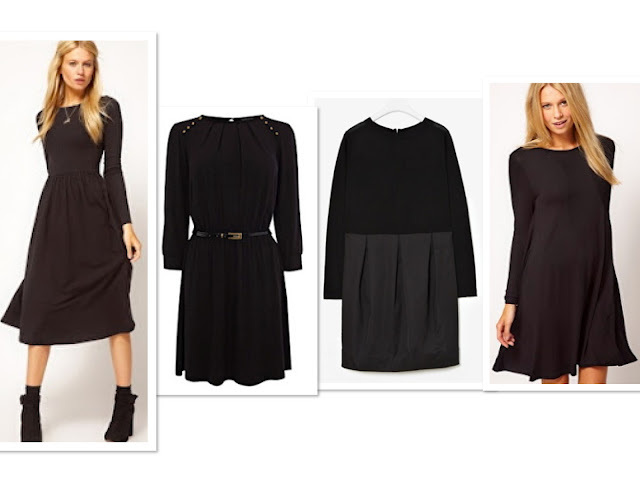 Midi dress with long sleeve, £28 ASOS; military button detail dress, £38 Warehouse; swing dress with long sleeves, £25 ASOS; pleated knit dress, £89 Cos.
Just seen that they do the long ASOS dress in burgundy - v v nice.